Now we’re rolling. Time to introduce our Group B designs. If you haven’t already, check out our introduciton to the Ribbon concept, which drives this project, and our first piece on designs for Group A. And with that, we’re set to dive into Group B. After the U.S. beat tied outplayed Portugal in the 2014 World Cup, I thought the Portuguese national team was about to enter a rebuilding phase. Portugal went out of that Cup during the group stage, its one otherworldly player was entering the back half of his career, and the supporting cast seemed to be fraying. Two summers later, Portugal were European champions and now, in 2018, they’re the top seed in a group that includes once all-conquering Spain. The research we did for Portugal led us to some beautiful places. Here’s where we ended up. We took particular inspiration from the dress of the Pauliteiros de Medina. 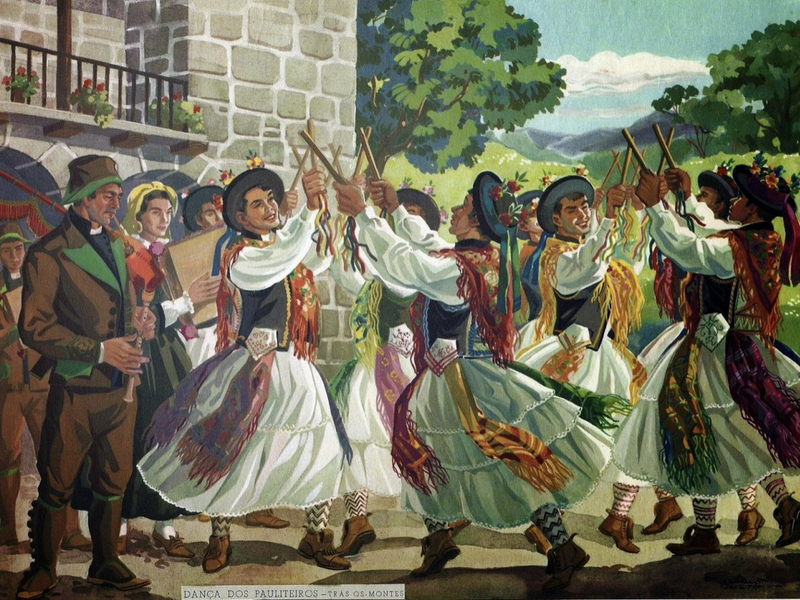 Over centuries, those from the mountainous and Celtic-influenced north perfected a kind of stylized, baton-wielding martial art, possibly as a way to keep their fighting skills sharp. Batons are held in both hands — one is for attack, and the other for defence. Not a bad metaphor for soccer. Note the wavy, top-most pattern. As generations passed, the training movements evolved into formalized dance — one still practiced by elaborately dressed performers. The embroidery is unbelievably detailed and colorful; unfortunately for our project, most of it is too complex for the type of pattern we were hoping to create. 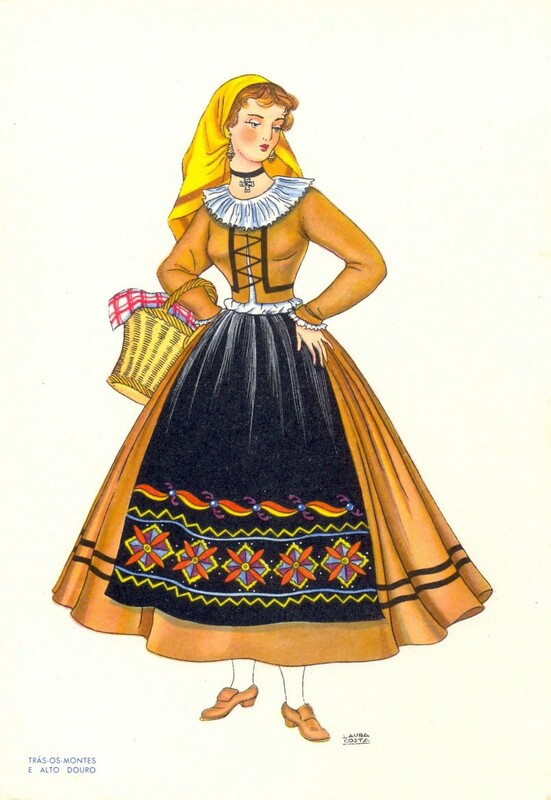 Luckily, I stumbled on the perfect Portuguese embroidery to emulate, tracing the hem of a traditional apron. The wavy, repeating pattern seemed to almost diagram the choreography of the Pauliteiros, down to what almost appeared to be tiny hands clutching invisible batons. Starting with that apron pattern as a primary influence, we worked to derive a Portugal ribbon. The color scheme was simplified to the country’s traditional scarlet and green, and attempted to reflect some of the dance-like movement and curvy detail found in the beautifully embellished source material. I think it came out pretty well. 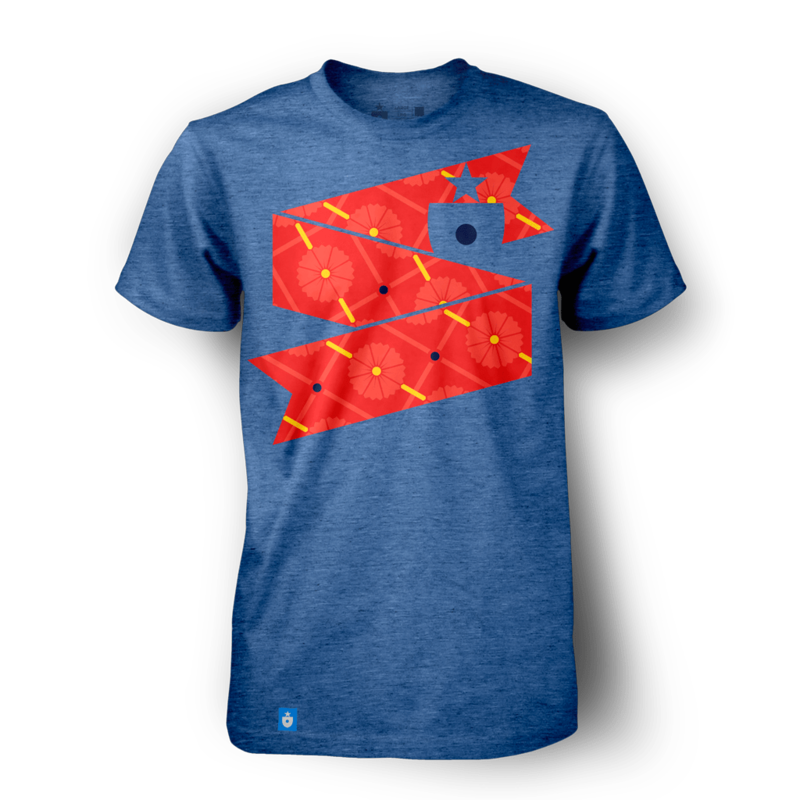 The Portugal Shirt, by Clean Sheet Co. The Portugal poster & scarf. Pageantry, color and motion — not to mention an intrepid spirit — make Portugal a fun identity to design around. If we were pinning World Cup fortunes to the richness of historic influences, Portugal would be a perpetual top seed. Group B created some interesting issues for the Ribbon project. We normally try to keep intra-group identities as separate as possible, but with three neighboring nations (Portugal, Spain and Morocco) that share a wealth of cultural influences, it wasn’t easy. Colors, symbols and traditions cross borders quite easily. Spanish and Portuguese identities, while famously separate and even rivalrous in many ways, share many qualities. Having looked to traditional embroidery for inspiration for the Portuguese ribbon, it made sense to go in a different direction for Spain. We wanted a design that projected national identity — and while there are some strong ones, regional symbols did not seem appropriate. We also needed something that could anchor, but not dominate, the design. The answer? 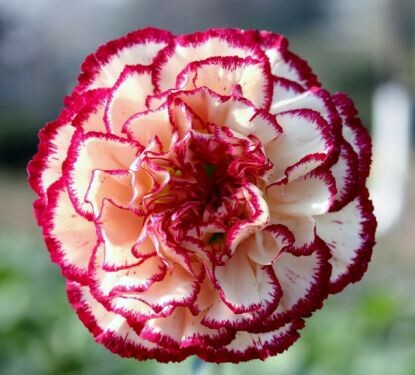 The clavel, or carnation — the Spanish national flower. Starting with a simple repeated red carnation, we built a pattern that reflected some of the intricate embellishment found on Spanish dress — including the ornate work that decorates a matador’s traditional uniform. Note the vertical pattern on the jacket — and don’t mind the rip. The matador inspiration helps us integrate another important visual differentiator: the color blue. Rich, vibrant blue (often found on traditional dress and on the national flag) is a color Spain (alone among its Iberian neighbors) claims as its own. 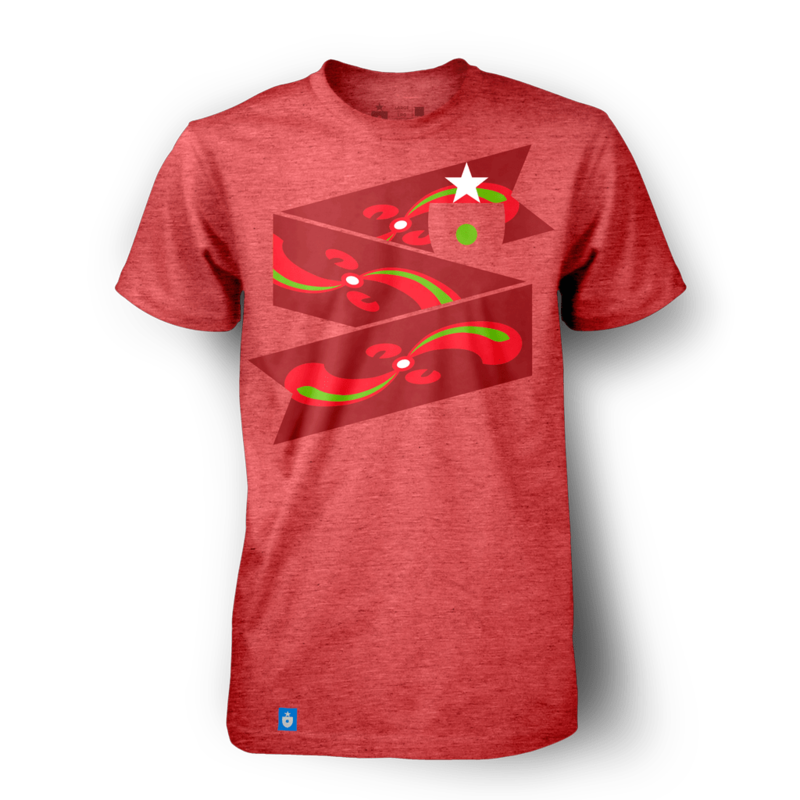 The Spain Shirt, by Clean Sheet Co. 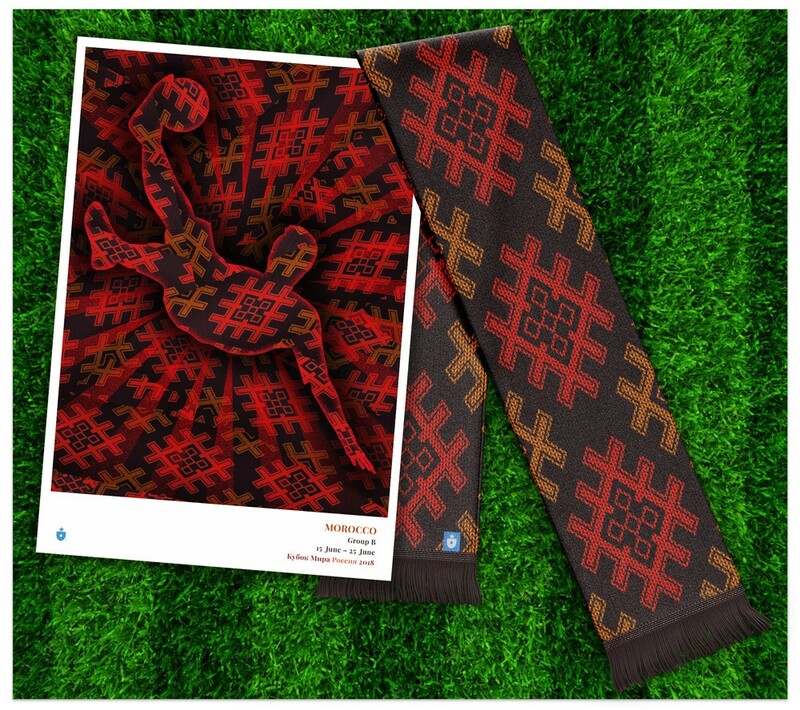 The Spain poster & scarf. Spain’s complex visual and cultural history could probably inspire 32 separate ribbons on its own. 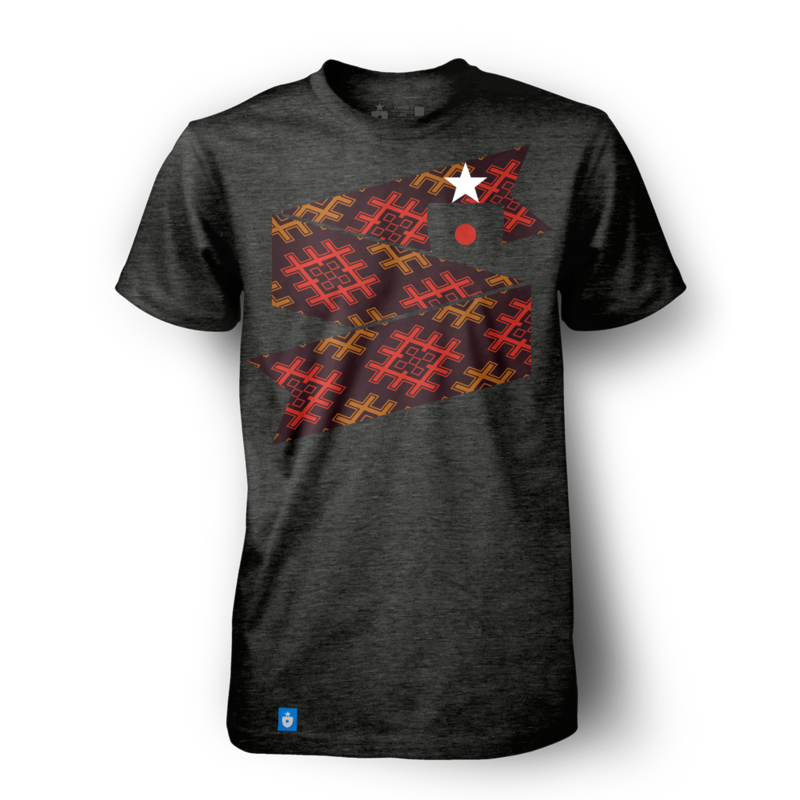 Here’s hoping the clavel-and-matador pattern is a worthy embodiment of the Spanish spirit. Leaving Portugal and Spain behind, we pass south from Gibraltar, across the mouth of the Mediterranean, into another world: Morocco. The culture, the symbolism, the language — even the alphabet — changes completely. It’s a place where styles of civilization smash into each other and create something new. Morocco is at a global crossroads, influenced by Iberian, Mediterranean, African and Middle Eastern cultures in turn. The country’s unique visual history has always thrived on its proximity to many worlds and many ideas. This clash of influences is expressed in everything from art to architecture — and perhaps most viscerally in a stunningly rich history of rugmaking and tapestry. 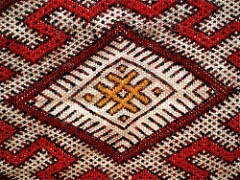 The patterns and flourishes found in Moroccan weaving aren’t purely decorational. Each symbol on a traditional Moroccan rug has meaning. We were particularly taken with the Lion’s Paw symbol (يد الصبع), a prominent motif that is said to symbolize strength. The Barbary lion, now extinct in Northern Africa, was once a frequent and inspiring presence in Moroccan culture. Their presence persists today, quite literally woven into Moroccan visual history. The Morocco Shirt, by Clean Sheet Co. 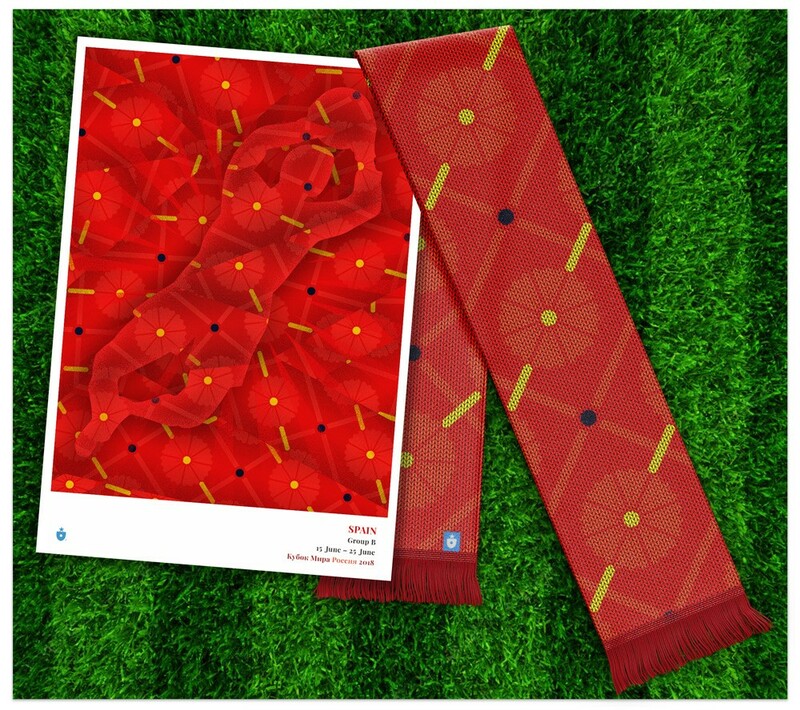 The Morocco poster & scarf. The more we worked with the Lion’s Paw symbol, the more it seemed to project a certain kind of power and authority. Morocco’s national team will do well to live up to its potent symbolism. From Morocco, we can follow a thread — perhaps one taken from a tapestry — across North Africa, through the Middle East to Iran. With Morocco, Iran shares many visual motifs that stem from a common root; in particular, it also shares a history of integrating cultural symbols in to beautiful weaving and rugmaking. 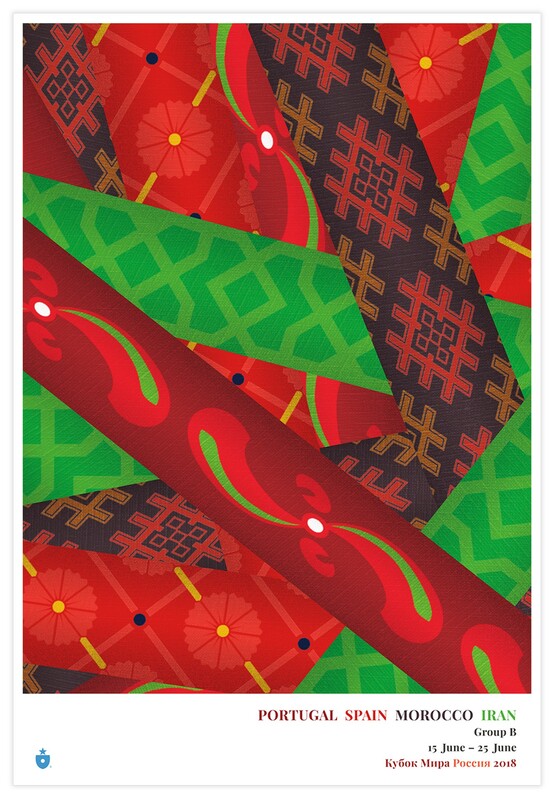 For our Iran ribbon, we wanted to use a color that had not yet featured prominently in our Group B work: green. While both Portugal and Morocco make some use of green in national color schemes, we hadn’t gotten a chance to use it prominently yet. Iran gave us that opportunity. We paired green with an obvious influence: the beautiful geometric patterns that show up across the culture, from rugs to mosiaics to architectural facades. 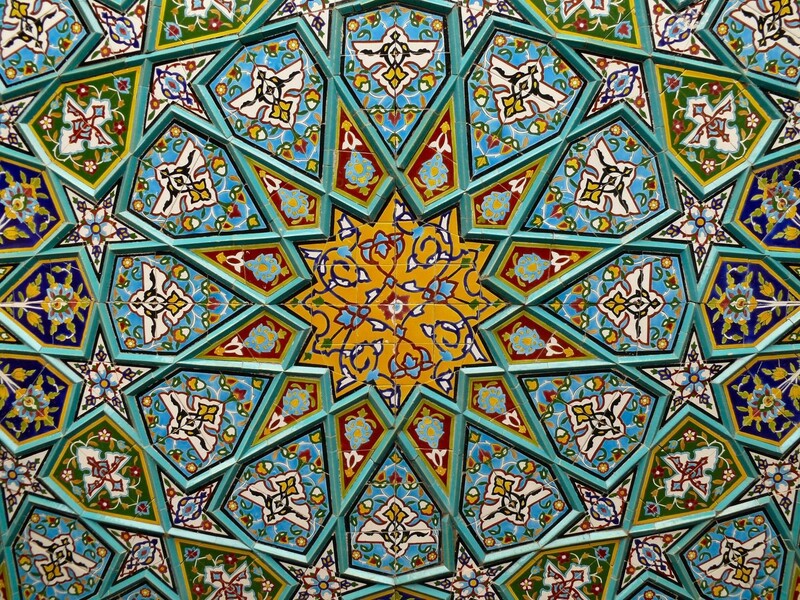 Iranian tile mosaic in Shiraz (photo credit: dynamosquito). To allow the green and the pattern to pop, we paired it with a heathered white t-shirt. This also has the advantage of mirroring the look of the national team’s white first-choice uniform. The Iran Shirt, by Clean Sheet Co. The additional material takes on tones of rich green that soften the energetic collision of lines and patterns. 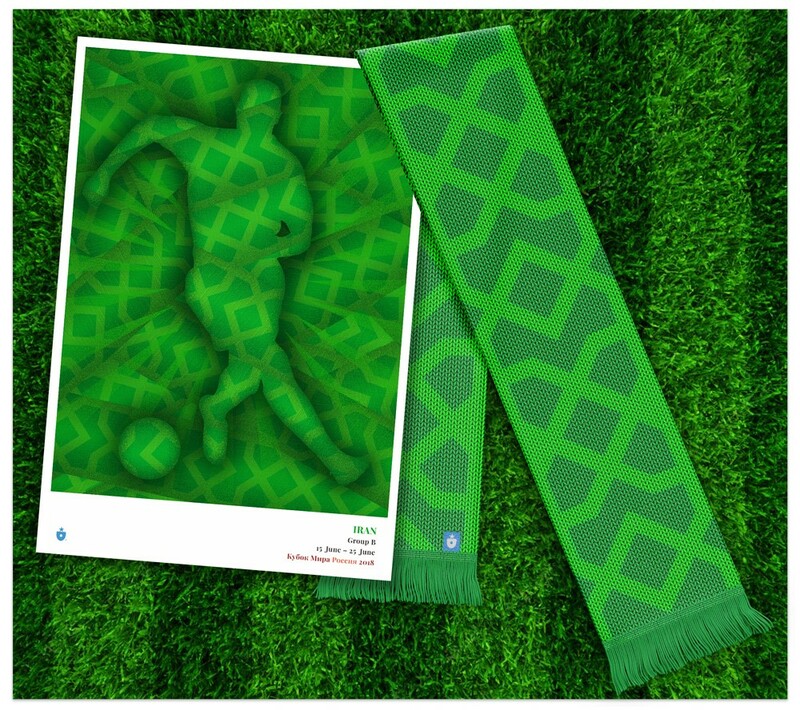 The Iran poster & scarf. Iran’s task on the pitch looks daunting; it’s been drawn into a group with unrelenting competition. With luck, and perhaps drawing a bit of strength from its beautiful cultural heritage, the team has a fighting chance. Once again, we’ve made a group poster, and we’re particularly proud of the visual and cultural interplay on this one. Like the national posters, these group poster prints are created with a gorgeous gicleé process and printed on your choice of stock (we prefer 11″ x 16″ on heavy photo rag, but you can’t go wrong with any choice). I can attest they look stunning. These ribbons continue to surprise and delight us. Two groups down. Six to go.